Ash (Fraxinus excelsior) is my favourite timber to turn, with possibly the greatest variation in grain and colour among our native timbers. 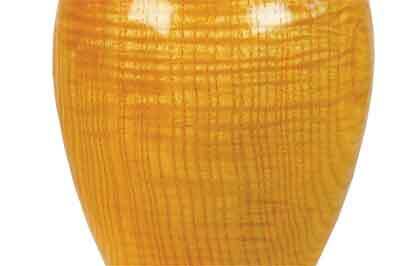 Ash is also our toughest timber in terms of tensile strength; its only weakness being that it is not durable outside but for turning vases, platters, bowls and all types of spindle work, including tool handles, it is a superb timber. The timber is slightly coarse and ring porous - think of the ends of the grain being like open tubes. 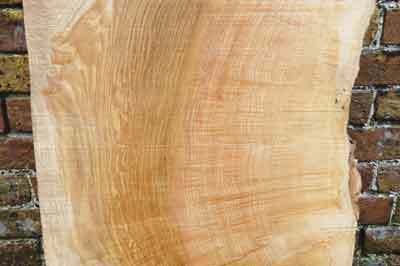 Generally a pale white in colour with prominent grain, the sapwood is not distinguishable from the heartwood but most will have olive stain in the centre. Interestingly, ash is a member of the olive family, which includes privet and lilac, so, as you can see, our description of 'olive ash' is not so far out. 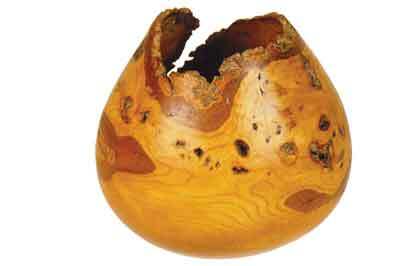 This olive stain - or black heart as they call it in Europe - is denser in terms of texture and weight than the white timber - and even small amounts of it can cause imbalance in the smallest bowl blanks on the biggest of lathes. This olive can be impervious to applied colours and stains and will also absorb finishing products at a different rate to white timber. For these reasons, production furniture makers prefer white ash for even finishing and staining. In mature parkland or field trees - those that have not been able to lean into other trees and share the stresses of high winds - ripple or basketweave grain is common in the buttresses around the base and under main forks. These forks can also yield spectacular flame figure grain that is coloured by olive stain and, if you're lucky, ripple too. Just occasionally, there appears the odd tree with ripple throughout and even rarer, one with olive stain right out to the bark but most blanks commercially available will be either white or with some olive stain. 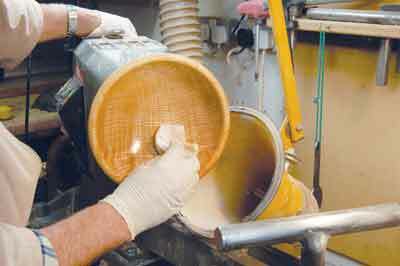 Some blanks can look like pure olive wood and even resemble a pale zebrano (Microberlinia brazzavillensis) at times. Spalting in ash that has lain out in the rain for a few years is not uncommon and can look spectacular, but most often, by the time the timber gets to this stage, it is too pecky to turn reliably. Ash bacterial canker (Pseudomonas savastonoi) is rarely fatal to trees and can add interest to the timber, either as large voids or small dark patches, which appear on the surface. Don't panic if you see the fine pin holes of the ash bark beetle (Hylesinus varius), as they are specific to ash, only live in the bark and cambium layer of the tree, but do not enter the viable timber. Like most timbers and especially pale ones, ash is best felled in the winter and before the new leaf buds begin to swell. When it is first cut, the white timber takes on a pinkish tinge, which soon disappears. 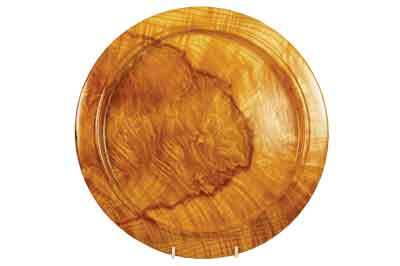 Ash is best milled soon after felling, which reduces the risk of grey stain in the sapwood. That said, we once milled some that had laid in the yard for two summers and they were as clean as new. It just goes to show that for every rule you think you have learned about timber, there is always a tree that disproves it and makes the job so interesting. The timber mills easily despite having a tough grain and is put into stick as soon as possible after milling, which helps to keep it clean. In my opinion, trees are like people: the young ones are strong, full of tension and therefore prone to being unreliable, whereas the old ones are more settled - possibly starting to senesce as the cells break down and lose their elasticity so are a little weaker - and more reliable, and this certainly can be the case with ash. Thinner section planks of 25-38mm are usually milled from the smaller trees. 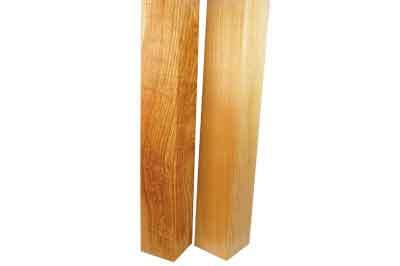 125mm planks are not an impossible plank thickness from larger trees, but 100mm is generally the thickest we mill. This is because with most hardwoods, thicker planks tend to shrink and harden before the core moisture has seeped out and as the outer case shrinks and the centre does not, something has to give, so splits appear on the surface. Heavy oak beams are the best illustration of this. Interestingly, ash is one of the few timbers that hangs into its bark during the drying process, especially if it is winter felled, so is therefore ideal for bark-edged bowls if you harvest your own timber. 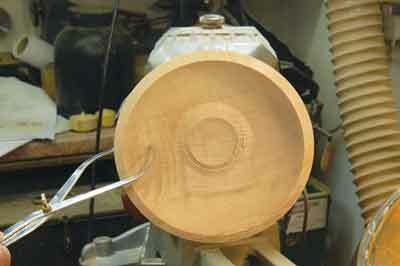 Commercially speaking, it is rarely viable to mill a tree to yield bark-edged bowl blanks. On hot summer days in the UK, timber stored undercover will dry to around 16% moisture content (mc) by weight - although we have tested sycamore at 12% - and during January, will rise up to around 20%. In our centrally heated houses, timber dries to around 8% or 10% mc. For woodturners, especially those of us doing bowl or faceplate work, ash this dry can be brutal to turn and may be the reason why some turners talk of it being hard timber. 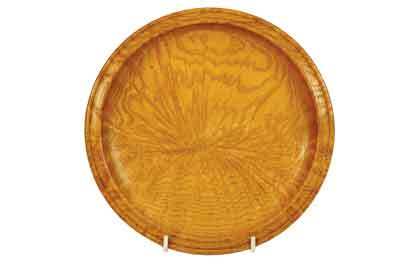 For spindle work, it does not make a huge difference as we will always be cutting with the grain, but on a bowl, where we are cutting with, against and across the grain twice per revolution, it can have the characteristics of a digestive biscuit. For this reason, we kiln dry ash to 14% mc or sell our air-dried ash at around 16%. It has more 'life' in it you might say. 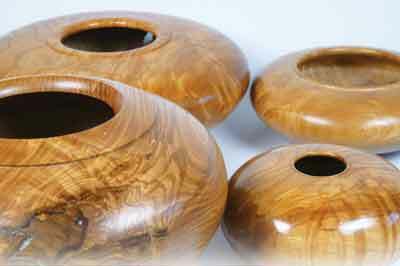 It will still shrink a bit - typically a bowl will go oval as it shrinks across the grain - when brought into a warm house but that extra moisture makes the timber altogether different for turning. This applies to all timbers but in my experience, especially ash. 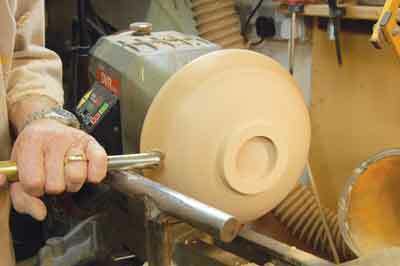 You might be starting with a prepared blank all nicely waxed around the edge or pieces you part-turned earlier and have figured a way of mounting it in the lathe. With some moisture, as mentioned earlier, the timber cuts easily and where you experience some grain tear-out in the wild areas or in the end grain, careful shear scraping will produce an excellent finish. I am a devotee of shear scraping with a ground edge of around 15° and a burr to cut with created on a grinder, rather than using a diamond hone. 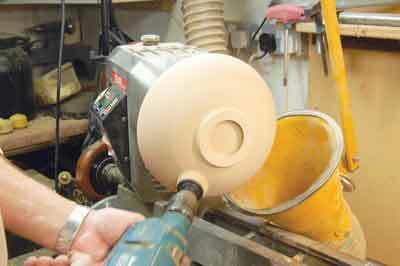 If you are turning a bark-edged bowl - this could be a round plug taken through the bark or even a branch if you are happy to risk the pith - go against the rule on the outside of the bowl and cut from the bark down towards the base; this will reduce the risk of lifting the bark off. It is against the grain of course, but it is a case of balancing one risk against the other. Abrasives work well on ash but where there are any slight torn grain areas - even after shear scraping - work on these areas by hand with the lathe switched off because no amount of finishing product will hide them! They can otherwise show as pale lines in the work. I always say that if you rub a car down with a house brick, no matter how good the paint sprayer, it will always look like a car rubbed down with a house brick. The same applies to wood. It is the finish you get on the wood prior to applying a finishing product that counts. After this, it would look good with just margarine rubbed all over it, but the shine would not last of course. A cellulose sanding sealer and paste wax give a good finish but not as good or as long lasting as oils. If you have the time and patience, then multiple coats of finishing oil or a hard wax oil give a lasting shine and patina. The platters shown on page 22 have had 10 coats over about a fortnight and 13 years on, despite having never been waxed, they still have a great shine. An alternative I have used only on bark-edged ash bowls is a shellac sanding sealer followed by paste wax. It seems to show the bark off better when compared to other products. Ash is not generally recommended for food use because of the ring porous grain. I guess the theory is that bacteria will lodge in these pores. Very few finishes are recommended for food use although this is not necessarily correct. Look for EN 71 compliant for food use or FDA approved for food use. I guess this is because harmful elements are detectable in the products both when in the can, and if the dried finish is analysed in a laboratory. Maybe it's the age we live in and maybe, years ago, they used whatever they could find because they didn't have a choice, but I would doubt their reduced longevity was ever attributed to using ash for food use. We have been using an ash salad bowl and a fruit bowl for over 20 years now, both finished with multiple coats of finishing oil, and we are all healthy and normal. Apparently. Ash dieback, caused by the fungus Chalara fraxinea is of great concern to us all and was, for a spell, a major news headline. It is reported to have killed between 60 and 90% of the ash trees in Denmark and there is no reason why our ash is any less vulnerable. Unlike elms in the '70s when Dutch elm disease ravaged the UK, it is not thought that the movement of unsawn logs poses a risk to the spread of the disease.